Scientists have discovered a small, dense planet orbiting a White Dwarf star. The discovery — a first for astronomers — sheds light on the twilight period of star systems such as our own. When stars of a similar size to our Sun run out of fuel for nuclear fusion, they become white dwarfs — a small, hot star-core surrounded by a planetary nebula formed from its shed outer layers. Scientists have long believed that white dwarfs could possibly host surviving planets in orbit around them. These planets would exist amidst a shroud of debris surrounding the white dwarf that remains from the planets destroyed when the object shed its outer layers. Until now, scientists have been unable to find evidence of such intact planets. Even the team that made this groundbreaking observation weren’t expecting such a result. 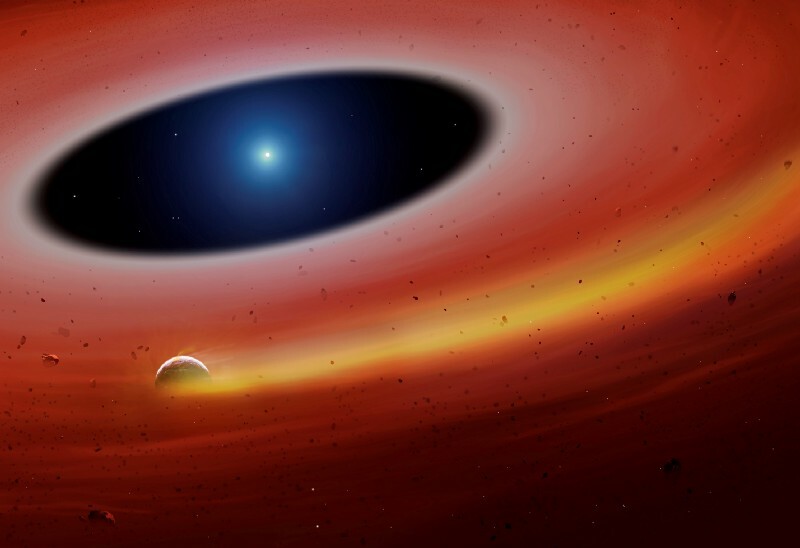 Manser, a professor in the Dept of Physics at the University of Warwick, and his team used spectroscopy to study the gas in a debris disc surrounding the white dwarf SDSS J122859.93+104032.9. This analysis revealed a periodic variation in gas emission lines that they concluded must be caused by a planetesimal orbiting within the disc. This marks the first time an intact planetesimal — a small planetary body — has been found in orbit around a white dwarf. He continues: “We were initially looking for random collisions between dust in the disc, that would create gas that we would then see as small flares in the emission from the disc. Manser and his team calculated that the planetesimal — which orbits close to the white dwarf every two hours — must be unusually dense and no larger than 600 kilometres in diameter, in order to avoid being ripped apart by the star’s gravitational forces. The object’s high-density gave the crew a clue as to its origins — they suspect it is the remnant core of a planet — the outer layers of which must have been violently stripped away by the tidal forces around the star. Luca Fossati, group leader at the Austrian Academy of Sciences, notes that the study’s methods could help identify other planetesimals orbiting white dwarfs that cannot be detected with traditional planet-hunting techniques. With regards to the future of this research, Manser tells me: “Our future research plans involve getting additional observations of SDSSJ122859.93+104032.9 to see if there are any interesting properties of the planetesimal we can learn about. The study, funded by the European Research Council (ERC, is published in the latest edition of the journal Science.